When your child is at an age where every little thing he or she is exposed to will affect the rest of his or her life exponentially, it just doesn’t make sense not to take the few minutes necessary to find out which accessories are best for your baby. Of course, that’s why you’re hear. Let’s take a look at the best baby activity centers on the market and figure out just what it is that makes one any better than the other, ensuring you and your baby walk away happy with minimal effort. No matter which products you decide to go with, you’re still going to end up with one of the most high-quality units on the market. However, by picking the right product (according both you and your baby’s own preferences and needs), you can increase the level of enjoyment you’ll be getting out of your next baby activity center. Of course, if you’re looking for the best bang for your buck (a great metric of quality in any product), the Vintage Boy has the top place among all products of its type. On the other hand, the Ocean Activity Center is most likely your best choice if you’d like a large degree of padding and a whole lot of additional toys alongside your unit. Be prepared to pay over double the cost of the Vintage Boy for such a privilege, however. 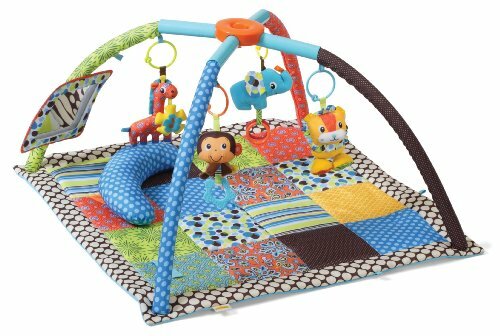 If you can’t decide between the two, or would simply like a music activity center that comes at a (relatively) agreeable price, the Love U Zoo deluxe is a great choice. If you simply cannot decide, you can rest assured knowing all three of the above products feature a level of quality which trumps that of nearly all other products on the market. The Ocean Activity Center, as its name quite accurately suggests, is a baby activity center which focuses primarily on comfort above all else. Even simply by looking at its picture, you’ll instantly come to realize just how soft and padded it truly is. This is especially great for very young babies, though it still works for babies of all sorts. Its high degree of comfort aside, it also comes with a few more features which go on to further radiate its quality. Like the last model we just looked at, the Ocean Activity Center comes with a musical device on the top of the unit where all of the poles meet in the middle. Some (though not all) of the toys hanging from the top of the unit will spin around while music plays. It also comes with a wider variety of toys than the above two products on this list. This is easily the most high-quality unit. However, relative to its increase in quality, you’ll find its price to go up disproportionately. As such, it’s not as frugal as the other two models we’ve covered thus far. As I’m sure you can guess, the Love U Zoo Deluxe comes with its own electronics which emit music. Outside of the shape of the bottom matt, you’ll find the Love U Zoo Deluxe to be nearly identical to the Vintage Boy on the grounds of physical appearance. As such, if you love how one operates on a physical level, you’ll likely love the other one just as much. However, the Love U Zoo Deluxe comes with a few more features built into it than the Vintage Boy. For example, it has a couple more toys involved. It also has a mirror hanging from one side, which you won’t find on the Vintage Boy. And, of course, it can play music. This is likely what most sets it apart from other products of its type, as it takes on a rather standard physical appearance. Of course, if you opt out of buying the Vintage Boy in favor of the Love U Zoo Deluxe, you’ll be paying roughly double the price. However, compared to other musical units of the same overall quality, you’re still getting an excellent bargain here. 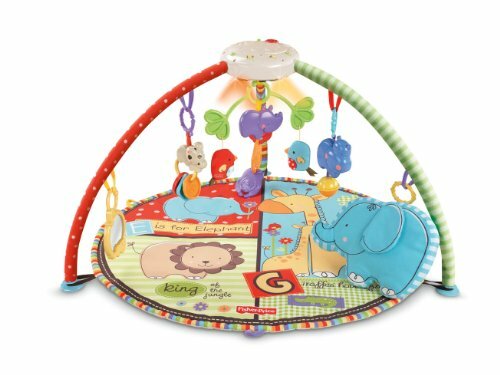 The Vintage Boy from the Infantino Twist and Fold line of baby activity centers has to be the best product of its type on a per-dollar basis. If you compare it to the vast majority of similar products for going up to twice as much cash, you’ll likely notice no difference between the two. Being a parent isn’t exactly a time in your life where your personal spending power will be at its highest, and Infantino caters to this specific issue through the release of this product. While its cost-to-quality ratio is already impressive, it has a few other features which further set it apart from others in the group. One such example of the features I speak of is the Vintage Boy’s on-the-go status. Whether you’re driving across the country or walking to daycare, you’ll be able to bring the entire unit with you when you go with little hassle. It can be folded up with a quick, two-step process which leaves transporting it from point A to point B a rather easy and quick ordeal. It also has a large degree of padding on the bottom, ensuring your baby’s knees, hands and/or back won’t get sore after playing in the Vintage Boy for any length of time. Not only is this a huge win for the baby, it’s a huge win for you as well, being that it will keep your child satiated and content for a longer period of time. No matter which of the above products you decide to go with, you’re still going to end up with one of the most high-quality units on the market. However, by picking the right product (according both you and your baby’s own preferences and needs), you can increase the level of enjoyment you’ll be getting out of your next baby activity center. Of course, if you’re looking for the best bang for your buck (a great metric of quality in any product), the Vintage Boy has the top place among all products of its type. What is a Baby Activity Center? If you find you’d like to branch out of the above list of products and do some shopping for yourself, you’ll find there’s a whole world of baby activity centers to explore. Of course, some products might be a bit better than others. As such, keeping the below list of tips and considerations in mind is sure to have you walking away with the best possible product at your disposal in no time. Is your baby walking yet? In the above list of products we just looked at, you’ll notice two of the baby activity centers had a large variety of toys on both the sides and the tops of the units. 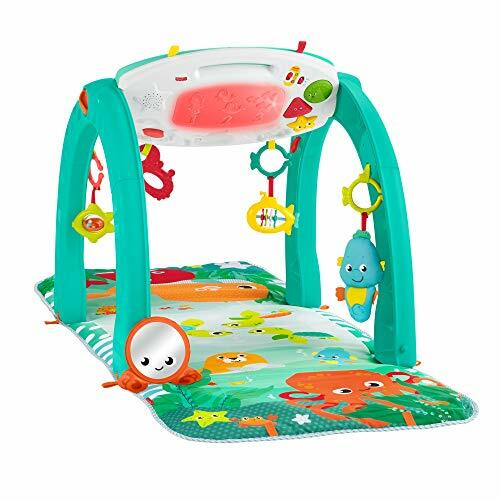 If your baby has yet to begin walking, this is perfect, as it will allow he or she to play with the toys nearest to the ground before the toys higher up are attainable. And, because many toys will currently be out of reach of your baby, the incentive to learn to walk will certainly be there. This, of course, is crucial. On the other hand, your baby may already be able to reach the toys nearest the top of any given baby activity center. If this is the case, you’ll find that slots for toys near the bottom of the activity center will offer less benefit. As such, you may be able to save a bit of cash here and there by opting for an activity center which places little emphasis on the sides of the unit, such as the Vintage Boy we covered above. Will you be traveling with your new activity center? It may be easy to come to the conclusion that all baby activity centers are very portable in nature. This is likely due to the large amount of lightweight materials used in their make. While it is certainly true that the vast majority of units will be extremely lightweight, carrying a giant unit isn’t exactly comfortable. Plus, the awkward distribution of weight jutting out your side as you carry it will make it feel a whole lot heavier than it looks. With that said, what are you supposed to do if you need to carry your new activity center around with you? Luckily, there are many activity centers which have been made for portability through allowing easy folding that may transpire over the course of five seconds or less. However, don’t be fooled by any old activity center that can fold. In fact, ninety percent (probably more) of units can fold up, though this doesn’t mean they’ll fold up easily or in a way that makes them easy to carry. Simply put, if a baby activity center isn’t advertised as being portable, you should probably take the manufacturer’s word for it and continue shopping around some more if you plan on traveling about with your new activity center through an efficient means. There are a few features you can expect to find in different baby activity centers which are truly neither good nor bad. In reality, it all comes down to you and your baby. Do you like any of the below features? Musical Capabilities – They say having your child listen to classical music will go on to raise their IQ. Whether or not you subscribe to this theory, you may like to offer your child a little more in the way of things to do in their new activity center. One way to do this is, of course, to add music. There’s a reason so many units have music boxes built into them in the first place – because they work. On the other hand, nothing marks up an activity center’s price like a music box. As such, you may find it beneficial to get a cheaper unit if you already have a source of music laying about, such as a phone, computer or stereo. Extra Padding – If your baby has mastered the art of walking to the point where falls and tumbles are no longer a concern, skipping on any extra padding can save a lot more money than you might realize. On the other hand, you may prefer that you new activity center comes with a little extra in the way of safety. Whether or not you opt for extra padding can rely solely on your own discretion. The above features are only suitable if you particularly want to see them in your baby’s activity center. The below features; however, should always be sought after. High-Up Toys – Part of the reason you’re getting a baby activity center in the first place is to stimulate your baby’s mental and physical development. As such, it doesn’t make sense to get an activity center which doesn’t give them the incentive to stand up by introducing toys placed higher up on the unit. Even if your baby is a long ways off of this point, such a feature will always pay off in the end and will likely cut down on the amount of toys you find yourself buying in the future. Removable Toys – When making a baby activity center, it costs next to nothing for a manufacturer to make the toys on the unit removable. As such, the price markup on such a unit will be negligible. That being the case, having removable toys may entertain your baby while having no real downsides. There’s really nothing to lose in this regard. Padding – I mentioned earlier that extra padding is optional. However, it’s always good to have at least a little bit of padding. It doesn’t need to be thick. Many units come with padding which could be compared to a very thin blanket. This will keep your baby comfortable, thus giving you a chance to sit back. Outside of getting a baby activity center with one or more of the above features in mind, the choices are nearly limitless. As such, knowing what you want before going into shopping is sure to net you an activity center both you and your baby will love. Parenting can be hard, but shopping doesn’t have to be.